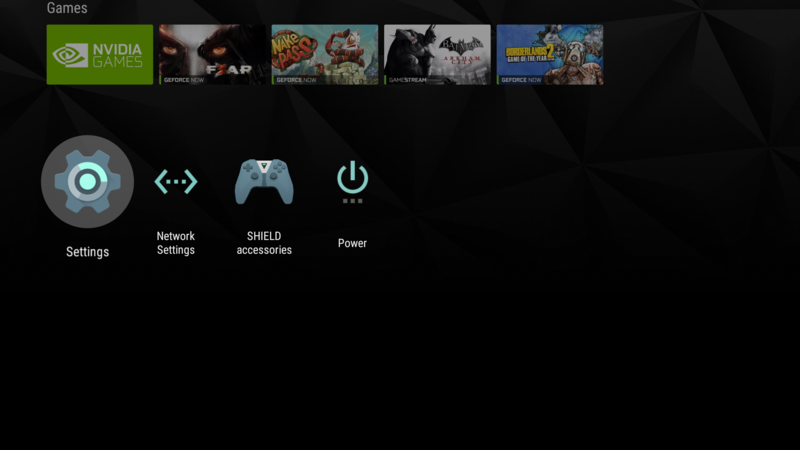 NVIDIA Home > Support Home Page > Knowledgebase Home Page > SHIELD TV - How to Set Up Hands-free "OK Google"
Update to SHIELD Experience Upgrade 6.0 or later software and then press the voice search button on your SHIELD remote or controller. Follow the onscreen instructions to complete the setup. 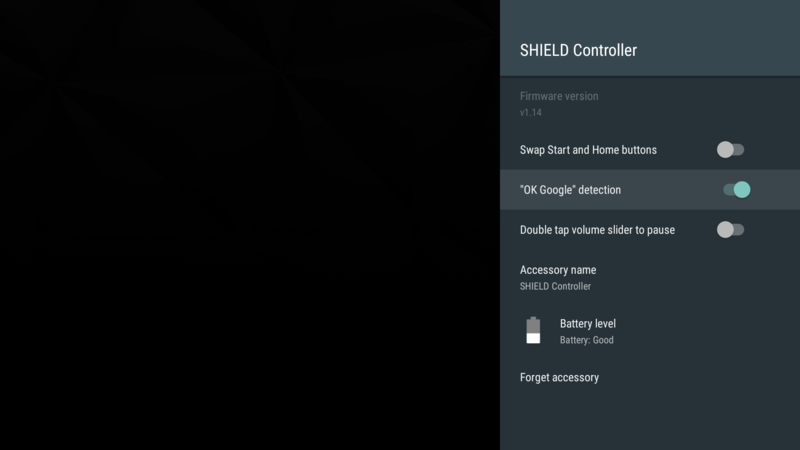 The 2017 version of SHIELD controller is required to enable hands-free "OK Google" support. 2) For Hands-free "OK Google" support, SHIELD controller (2017) requires firmware version 1.14. Note: SHIELD controller must be charged to over 30% battery life before the firmware can be updated. See additional troubleshooting steps below. 3) Google Play Services App - confirm version is 11.5.17 or higher (Settings > Apps > Google Play Services). Open the Google Play Store app to accept the Terms & Conditions. Google Assistant on SHIELD TV is currently available in the United States, France and UK. 1) Press the Voice Search button: Press the microphone button on SHIELD remote or the NVIDIA button on SHIELD controller. 2) Say "OK Google": Say "OK Google " or "Hey Google" to your SHIELD controller without picking up a remote. This works best when you are 3 to 5 feet from your controller. SHIELD controller (2017) is required to enable hands-free "OK Google" support. How Do I Enable "OK Google" Support? Your SHIELD controller (2017) has a microphone that can listen for "OK Google" or "Hey Google". 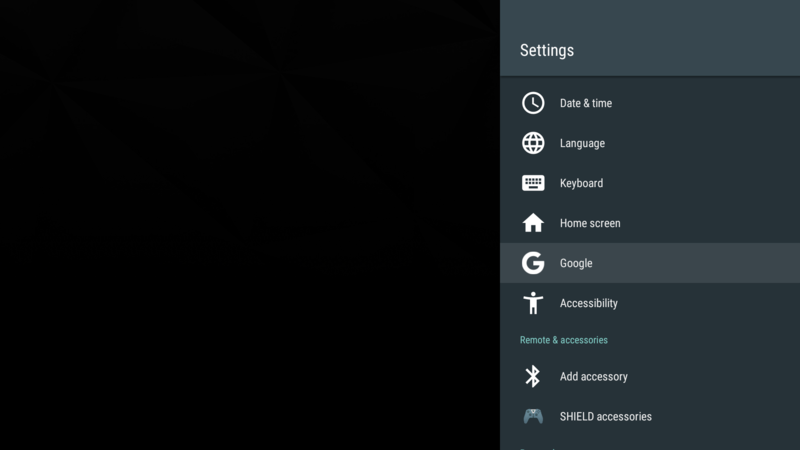 This is an optional feature that can be enabled as part of the initial Google Assistant setup if you have a SHIELD Controller (2017) connected. You can enable this feature later in Settings. If you have more than one SHIELD controller, you can enable and disable this feature per controller in Settings > SHIELD accessories > [Select controller]. Note: This feature requires your SHIELD controller to be always on and will therefore reduce the battery life between charges. To temporarily mute "OK Google", select the microphone icon on the Settings row of the home screen. Hands-free "OK Google" support requires firmware version 1.14 or higher for your SHIELD controller (2017). SHIELD controller must be charged to over 30% battery life before the firmware can be updated. You can check the firmware version in the SHIELD accessories setting on the SHIELD TV home screen. 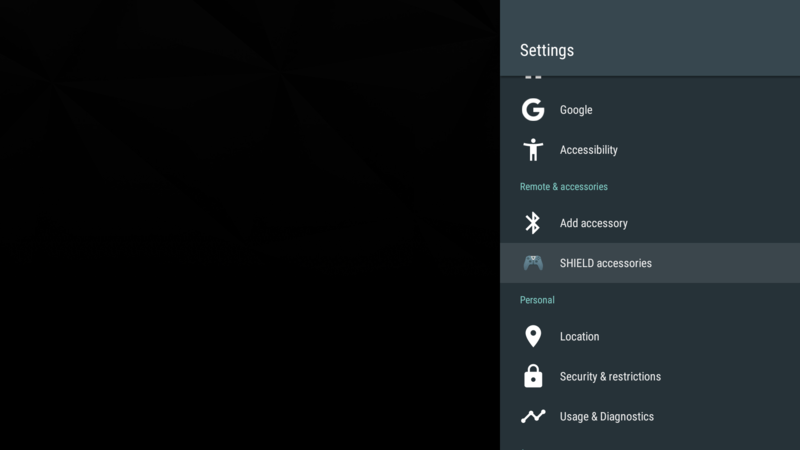 In the Settings row on SHIELD home screen, select SHIELD accessories using your SHIELD controller. Navigate to the "active" controller and select it. If it show that there is an "Update available", apply the update. Make sure your controller is adequately charged before applying the update. If you did not enable "OK Google" as part of the Google Assistant setup , you may need to manually enable it by following the steps below. 2) From the Settings column, scroll down until you see the Google settings and select it. 3) Select Enable "OK Google" detection. 6) "OK Google" is now enabled. Go back to the SHIELD TV home screen. Scroll to the bottom of the screen. A new microphone icon should appear next to the SHIELD accessories icon. Verify that "OK Google" enabled appears under this icon. If you see "OK Google" disabled, select the icon to enable it. 7) In some cases, a SHIELD system restart may be required for "OK Google" to work. If you are not able to manually enable "OK Google" detection and you have verified the software on your device is up to date (SHIELD Software Upgrade 6.0/SHIELD controller 2017 firmware v1.14), go into Settings -> Apps -> search for the Google app (under System apps) and select it. Scroll down and select "Clear data" and then go back and repeat steps 1-6.